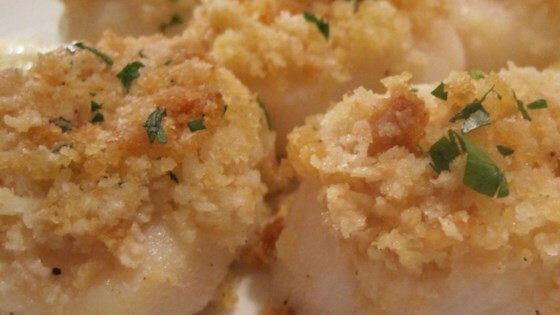 "Large sea scallops are combined with garlic, shallots, butter, and bread crumbs then baked to perfection. Being from Maine, we love our seafood, and this is one of the greats!" These baked scallops are so buttery and so garlicky. Yum! This recipe was horrible. Way too much of the bread crumbs. They didn't seem to match with the scallops. The scallops were boring. Will not make this again. This recipe is awesome! I made this to the directions for my wife's 40th birthday party. The only problem is the guests wanted more! The only recommondation is you Must use Digby Scallops. This recipe is great AND simple. I placed lightly sauted asparagus and sliced mushrooms in the bottom of an individual serving dish and placed the scallops on top. My husband loved it. This recipe is so quick & simple, yet elegant enough to serve to company. I have made it several times now and it has become a favorite of ours! I am so happy that I have found this recipe.